Mocking Bird, an American passerine bird, of the subfamily mimince, and genus mimvs (Boie). The subfamily includes the catbird, brown thrush, and nearly 20 other mockers, arranged by Gray under the single genus mi-mus, but subdivided by Cabanis and others into nearly as many genera as species. The restricted genus mimus has the bill shorter than the head, slightly curved from the base, and notched at the tip; the gape furnished with bristles; lower jaw with no longitudinal ridges; wings moderate and rounded, with the first quill very short, the second longer, and from the third to the seventh nearly equal and longest; tail long and graduated; tarsi longer than the middle toe, robust, and covered in front with broad scales; toes long, with sharp curved claws. The size is large, and the general appearance thrush-like. The species of this genus are found in North and South America, the West Indies, and the Galapagos islands; they are shy, active, and migratory, feeding on insects, berries, and worms; the song is highly pleasing, and the powers of imitation are very great. The common mocking bird (M. polyglottus, Boie) is about 9 1/2 in. long, with an extent of wings of 13 1/2; the bill and legs are black; the general color above is ashy brown, a little the darkest in the centre; the under parts white, with a brownish tinge except on the chin, and a shade of ash across the breast; a pale superciliary stripe; wings and tail nearly black; lesser wing coverts like the back, the middle and greater tipped with white, forming two bands; outer tail feather white, the second mostly so, the third with a white spot on the end, and the rest, except the middle, slightly tipped with white. It is found in the southern United States, from the Atlantic to the high central plains, replaced by the M. montanus (Bonap.) to the westward. The song of the mocking bird, in its mellowness, modulations and gradations, compass, and brilliancy of execution, is unrivalled; it can adapt its tongue to any note; it deceives the sportsman, cheats and terrifies birds, whistles to the dog, and imitates almost every sound, animate or inanimate; it sings charmingly at night, commencing as soon as the moon rises; its finest song is during the breeding season. It delights to build in gardens near houses; the eggs are usually five, light green with brown spots and blotches. They begin to pair toward the end of March, and three broods are generally raised between that and the last of September. They remain in the gulf states all the year; some go to the north in the spring, returning in October; they are most plentiful near the seashore, in sandy districts scantily furnished with trees; in winter they live principally about the farm houses and plantations. Their motions on the ground are light and elegant, accompanied by frequent openings of the wings and tail; the flight is short and jerking. The call note is very mournful, like that of the M. rufus (Boie), the French mocking bird so called. Its courage is sufficient to defend it against most birds of prey. It is easily reared by hand from the nest, and becomes very familiar and affectionate in confinement; its vocal powers, though great in captivity, are very much greater in its native haunts; it is long-lived, and a good singer always commands a high price. The female differs little from the male, but the plumage is somewhat duller. 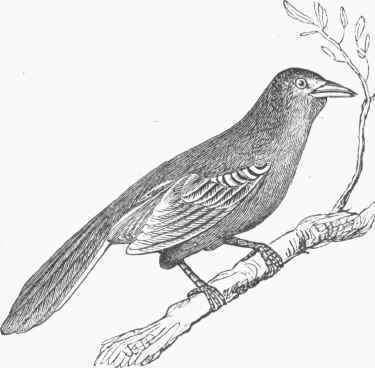 The M. Carolinen-sis (Gray) has been described under Catbird. Other species are described in South America, and on the Pacific coast of North America, all possessing remarkable powers of song.